San Diego Unified School District board members voted unanimously Tuesday night in favor of a plan to address Islamophobia and bullying of Muslim students. More than 200 members and supporters of the city’s Muslim community erupted into applause after the vote. 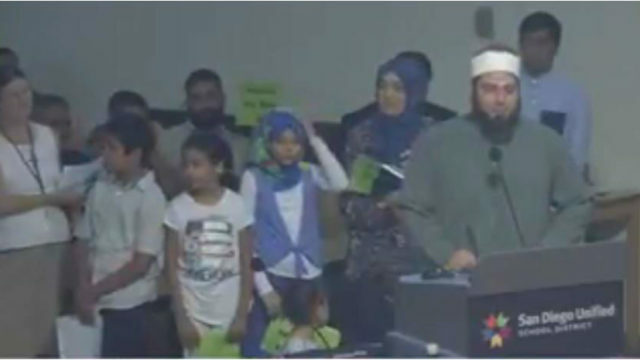 “You guys are essentially the reason why this district is one of the safest in the nation,” said Hanif Mohebi, executive director of the San Diego chamber of the Council on American-Islamic Relations. “We must provide the right resources to (educators)” to lessen bullying incidents, by suggesting professional development and the proper curriculum, Mohebi said. “Please help us stop this kind of blame so no one else gets hurt,” she added. Board member John Lee Evans commended the children for speaking out at a time when the nation’s political discourse has taken negative turn. In other matters, the board voted unanimously for a resolution calling on the California Public Employees’ Retirement System and California State Teachers’ Retirement System to divest their investment portfolios in fossil fuels companies, a move that some in the gallery applauded. Senate Bill 185 requires that the district release quarterly updates on divesture to the public.